Steve Alford is back in Indiana this week for the first time since he took the UCLA job -- and the full-circle effect is in full swing for the native Hoosier. After learning about the game in the same Martinsville gym where John Wooden once played, he dreamed of playing for Indiana and Bob Knight. Yet he never once thought he would be UCLA's head coach. "It's a real surreal feeling," said Alford at a basketball camp in Franklin, Ind. "The Olympics is nothing I ever dreamed about. I dreamed about playing for Coach Knight and Indiana. The  Olympics came out of nowhere and a blessing I will never forget. It is very similar. "I never dreamed I would coach at UCLA. It was not one of those things in my coaching career I thought would happen. It's a tremendous blessing, and I'm going to make the most of it." But the time to romanticize about being the UCLA head coach is over. Alford was blindsided at his opening UCLA news conference about how he handled the sexual assault case of a former player, Pierre Pierce, at Iowa. The Los Angeles Times did an exhaustive piece on the subject, prompting a May 18 statement from UCLA athletic director Dan Guerrero supporting Alford and essentially defending him. Alford also dealt with the debate over his buyout. The agreement was finalized with Alford paying New Mexico $300,000, a reduction from the original $1 million demanded in the 10-year contract extension he agreed to (but didn't sign) just days before accepting the UCLA job. The damage control from that rocky start is done, but the assignment doesn't get any easier. Now he has to manage a program where expectations have not dwindled. In 2012-13, Ben Howland took the Bruins to the top of the Pac-12 regular-season standings, getting to the NCAA tournament despite an injury-riddled season. Meanwhile, Alford led New Mexico to another Mountain West Conference title, but the team flamed out as a 3-seed in a stunning round-of-64 loss to Harvard. Alford has been to the Sweet 16 just once in his 18 seasons as a Division I head coach. Can he take the Bruins there? Alford certainly faces a tough task, having lost many of the team's best players from last season. Larry Drew II, UCLA's anchor at point guard, was a one-year player and is gone. Shabazz Muhammad posed a huge matchup problem for opponents, despite all his eligibility baggage, but he declared for the NBA draft. Sophomore-to-be Jordan Adams, arguably the Bruins' best player last season, is still recovering from the broken right foot that sidelined him for the NCAA tournament. "He's out of the cast and out of the boot either Tuesday or Wednesday," said Alford, who had to re-recruit Adams and persuade him to stick around Westwood. "We're just taking our time with him and making sure there are no issues moving forward." The resulting void has created an opportunity for point guard Kyle Anderson, who joined Muhammad as a top-five recruit last season. However, with Drew around, there wasn't much of a chance for Anderson to play. "He's very versatile at 6-8 with a 7-foot wingspan [and] is really long and extremely talented," Alford said. "We can play him at multiple positions." Alford's son Bryce, who was invited to the FIBA USA U-19 team tryouts last weekend, will be the other point guard. The younger Alford was a big-time scorer at La Cueva High in Albuquerque and received the necessary waiver to transfer immediately after his father moved from UNM to UCLA. "[Point guard] is a position [where] we'll be tested by youth," Alford said. "Kyle can play all over the floor, and we may have a four-guard lineup with him at the point and Bryce would be the other point guard." Incoming ESPN 100 recruit Zach LaVine is also listed as a point guard, and while Alford thinks highly of his talent, the Washington native won't be put in a lot of pressure situations early. Alford must work out the rest of his roster as well. The wings will be Adams and sophomore Norman Powell, a strong, athletic guard. First-year Noah Allen is a small forward, and Texas Tech transfer Wannah Bail, who is seeking a waiver to play immediately, is a power forward. With the addition of Allen and (maybe) Bail to Tony Parker and the veteran leadership of the Wear twins, Travis and David, the UCLA frontcourt is relatively set. None of those big men are traditional low-block players who command attention, but they will need to demand the ball to create floor spacing. Of those four players, Parker is most likely to grow into that role and develop into a productive post. "He's lost 18 pounds in the first two months we've been here," Alford said. "He looks much, much better." Another concern for Alford is depth. If Bail is not cleared to play, the Bruins will have just nine eligible players on the roster. That deficit will make it tough to compete with Arizona, the clear favorite in the Pac-12. UCLA will be in a second tier with Oregon, while plenty of upstarts, such as Colorado, Arizona State, Stanford and Washington, could also challenge. However, while obstacles are certainly mounting for Alford, important pieces are falling into place. The whole Alford clan is moving to Southern California next week. A new strength and conditioning coach has been hired. A number of speaking engagements have been scheduled. Alford is also hoping to work in an alumni social on July 8-9 to bring outspoken, former UCLA players back into the fold. With that stress out of the way, Alford can now focus on recruiting. "We've got to hit the ground running for the 2014 and '15 class," Alford said. But the play on the court next season takes precedence -- make no mistake about it. Patience is not in the dictionary for UCLA fans, many of whom weren't exactly enamored with the hire -- or the PR hits that ensued. Alford knows that and has no choice but to challenge for titles in the conference right away, and ultimately nationally. Just like every other UCLA coach since the mid-'70s, that's the legacy he has to uphold -- the one set forth by a fellow Indiana native whose fingerprints still cover this proud program. Editor's Note: In our ongoing Path to the Draft series, UCLA came in at No. 7 on Tuesday. Click here to read the full piece. UCLA is looking for a coach who will excite the fan base, fill Pauley Pavilion and produce a Showtime-like scene in Westwood. Oh, and retain players; enough so if there is a major injury like Jordan Adams' broken foot in the Pac-12 tournament semifinals that it doesn't expose a glaring depletion in the roster due to a series of transfers during the past three years. That's essentially the job description UCLA athletic director Dan Guerrero unveiled during a Sunday night teleconference after he said he fired Ben Howland earlier in the day in his UCLA office. Guerrero said he would cast a wide net, but multiple sources say he will lock in on Virginia Commonwealth's Shaka Smart. The question is, Would Smart be receptive to going West? Those close to Smart aren't so sure. Smart stayed at VCU instead of going to Illinois, which is closer to his Wisconsin roots. He has strong ties to the Southeast, too, having worked at Florida. Smart has no ties to the Los Angeles area. Smart does bring his 'Havoc' defense -- known for its frenzied, turnover-producing pressure -- and the brand of basketball that would certainly get the fans amped. All you have to do is see the atmosphere in Richmond for a Rams' home game or even when VCU was in the tournament to gauge the palpable enthusiasm for Smart's style of play. The problem is Smart might not want to deal with the bubble that has become the UCLA program. Trying to fend off the agent culture, the pro-like atmosphere and the overall pressure of being the UCLA coach isn't for everyone. Howland was there 10 years and had his problems with players at times, but he still won at the highest level, and it will be hard to match his strategic success. Two of the more obvious choices -- Gonzaga's Mark Few and Butler's Brad Stevens -- likely wouldn't touch the job, according to those close to them. Few hasn't left Gonzaga for other high-profile jobs (he once was part of the Indiana search) because he loves his fit with the Zags. He's not an L.A. guy. Stevens isn't, either. And Stevens, as wonderful as his run has been, doesn't fit this latest description of a style to watch. Stevens also loves his Butler life and has shown zero signs of wanting to leave and go West. If UCLA stays with a college coach -- and Guerrero said he is open to anything -- then this could mirror the Illinois job search from a year ago. The Illini found a gem in Ohio's John Groce, but he wasn't the first choice (Smart was). NC State's Mark Gottfried and Washington's Lorenzo Romar, two former UCLA assistants, would listen, according to sources. But it might be hard for UCLA to look at Romar, who currently runs a Pac-12 program that has hit a downward cycle recently, or go East to look at Gottfried, a former Jim Harrick assistant. That's why there are outliers who could be in the mix -- coincidentally for both the open USC and UCLA jobs -- in Memphis' Josh Pastner, Cincinnati's Mick Cronin and a new wild card in Wichita State's Gregg Marshall. Marshall makes more than $1 million annually at Wichita State but has energized the fan base and now has the Shockers in the Sweet 16. He's not a West Coast coach, either, but could suddenly be an intriguing name if the Bruins need to go further into the search. Guerrero wouldn't say if he is interested in a coach who is still in the tournament, but if so, then he would obviously wait until the coaches of any remaining teams are eliiminated. What the next coach has to understand is that the culture around the program is hard to change. The plusses of having so many pros playing pickup is the access the current players get to high-level talent. The negative is that it would be hard to control the outside influences. If the Bruins stay relatively intact, then the roster is more than ready to compete atop the league, with Adams being one of the best returning players in the country and teaming with Kyle Anderson -- who isn't ready for the NBA like classmate Shabazz Muhammad is -- to form at least a nucleus for a new coach (similar to the situation Groce walked into at Illinois with the return of Brandon Paul and D.J. Richardson). UCLA is paying Howland a $3.5 million buyout ($2.3 million for the first year and $300,000 for each of the subsequent four years, but it is negotiable if Howland takes another job). Guerrero said the money will come from an $80 million budget the school has for the athletic department. So there is suddenly money to pay a head coach, which wasn't always the case at UCLA. However, travel accommodations would have to change to lure a reputable coach, as the team has taken to flying Southwest Airlines -- as opposed to a more comfortable, chartered ride -- on road trips. The new Pauley is a plus, but the pressure to produce not just Pac-12 champions but Final Fours is real. Guerrero said he wouldn't speculate on what would have happened if Adams were healthy and the Bruins were playing next weekend. Guerrero may have officially made up his mind Sunday, but he knew it was over weeks ago, or else this day wouldn't have come so soon after the loss. Smart is the slam-dunk hire, but he's hardly a lock to accept if an expected offer comes his way. If he doesn't, then this job is likely wide open, and whomever gets the gig will have to think hard about the expectations, the pressure, the longevity and, ultimately, the lack of security being the UCLA head coach offers. Larry Drew II has an opportunity he never had at North Carolina. He has a chance to be a leader, to take over a team, to be given a squad that will be his to steer. 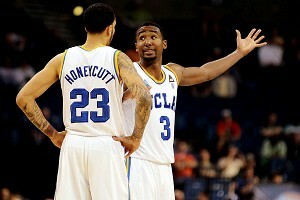 UCLA coach Ben Howland said Thursday that the Bruins need Drew II to be the voice of this team. Apparently, there is no one else Howland wants to take over this team in its time of need. "The guy that needs to do this is Larry," Howland said as the Bruins prepared to leave for Houston for Saturday's game against Texas in Reliant Stadium. "He's a fifth-year senior. He's done a real good job. We need him to pick it up another notch, and I think he can do it. He has to do it. I'm pushing him harder to be that guy." Drew was the starting point guard at North Carolina two years ago before he was replaced by then-freshman Kendall Marshall in February 2011. Drew subsequently left the team and transferred. UCLA took him to sit a year and play one year. Drew hasn't been vocal in L.A. -- yet. He hasn't shot the ball well, knocking down less than 40 percent overall and 20 percent on 3s. But he has had quite an assist-to-turnover ratio at 8.5 (68) to 1.4 (11). He had 11 assists and two turnovers in the most recent game, a nine-point loss to San Diego State in Anaheim on Saturday. The Bruins need someone to take over this team. Freshman Shabazz Muhammad has the personality to do so, but he might be in the wrong position. It's not as easy to be the decisive leader as a forward. It's always easier if it's the playmaker. The Bruins have had success with a point leading the team from Jordan Farmar to Darren Collison to Russell Westbrook. Howland pointed out that all three are in the NBA and have been highly successful. No one is assuming that for Drew. All the Bruins would like is someone to take charge, which that hasn't happened in an erratic, underachieving season that has included a home loss to Cal Poly. The Bruins have seen two transfers already in the fall semester -- Tyler Lamb and Josh Smith -- and getting a healthy Tony Parker back in the rotation is much needed. "That gives us eight guys who are going to play," Howland said. "Half of our rotation players are freshmen. The veterans have to step up and be better leaders and exemplify what needs to be done to execute offense and defense." Howland was pleased with the practice Wednesday and is intending to play his more favored man-to-man instead of zone against the Longhorns. But working on man-to-man in an exhibition game this week also affirmed for him how far the Bruins still have to go defensively. Kyle Anderson, who brings the ball up at times, isn't going to be the leader. Nope, it has to be Drew for the Bruins going forward. "I'm pushing him," Howland said. "I want him to do it by example by how hard he plays. Larry gets into floating modes. We need his motor up. He does a great job in decision-making. It has been fantastic." But his leadership hasn't been equal as of yet. If Howland is right and Drew is the player to start directing this team, that will be one important role defined in a season that needs to find its path sooner than later to avoid being derailed. Anthony Gruppuso/US Presswire You know it's a down year when your regular-season champ doesn't make the NCAA tournament. 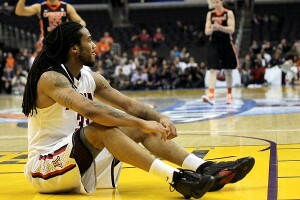 Stephen Dunn/Getty Images The Pac-12 tourney has had some thrillers over the years, but few in L.A. bothered to notice. UCLA has the No. 1 recruiting class in the country, and the Bruins are giving themselves every chance to be successful by going on the Pac-12's inaugural tour of China in August. With the diverse student body of a number of his member schools, Pac-12 commissioner Larry Scott has made Asia a priority, hiring Shanghai native Carrie Xu to be a senior manager for the conference. Xu is the creator of ChinaSportsBiz.com and has an MBA from USC. Scott, who traveled to China in December, said the summer tour of the country is the first event in the initiative and something "we've been working on." "Basketball is the most popular sport in China," Scott said from this week's Pac-12 meetings in Phoenix. "We're working on having UCLA play the equivalent of NCAA competition in China, as well as this being a goodwill and diplomatic tour. "UCLA will represent the Pac-12 and plant a flag for the conference. We expect this to be an annual basketball trip by our schools, playing future collegiate teams and the Chinese national team." Placing the Pac-12 brand in Asia -- and ultimately Pac-12 games -- is a priority, and what better way to show off the conference than displaying the most recognizable brand in the league, UCLA basketball. "This is a big deal," Scott said. "This is part of our plan to get the Pac-12 Network out there. There's no better way to kick this off than with UCLA basketball." The timing couldn't be better for the Bruins. UCLA desperately needed a head start on the season after finishing a disappointing 19-14 (11-7 in the league) and missing the postseason. Ben Howland's program was also the subject of an extensive Sports Illustrated story, detailing the management of enigmatic former Bruin Reeves Nelson. The Bruins also will have former North Carolina guard Larry Drew II eligible, and the newcomers can make the trip -- the freshmen just need to pass a first-session summer school class. The only question mark is Anderson, who had surgery Monday to repair a thumb injury. "It was less than what was anticipated," Howland said. "He didn't have to have ligaments repaired. It was a tissue of his ligament. They originally thought he would have to take a ligament from his wrist and attach it to his thumb. They didn't have to do that." The Bruins will need returning center Josh Smith to be in shape and need major contributions from Tyler Lamb, Anthony Stover and Travis and David Wear. Howland said his team will take full advantage of the NCAA rule that allows 10 practices prior to the trip. He said the Bruins will practice five times spread out over the first two weeks of August and five days leading up to the Aug. 21 departure. UCLA is scheduled to return Aug. 29. Going on this trip could catapult the Bruins to a strong start to the season. A year ago, Georgetown and Duke both went to China and benefited greatly from the experience. The Hoyas even brawled with the Chinese, which was unfortunate but ended up being a bonding moment for the team. In addition, Howland said the Asian, and more specifically the Chinese, population at UCLA and other California schools makes it even more sensible to go on the trip to foster interest in the programs. "We're promoting our brand, basketball and the conference," Howland said. The Bruins won't slow down when the season starts. UCLA is in the Legends Classic in Brooklyn, N.Y., with top-ranked Indiana along with Georgetown and Georgia and plays Texas in Houston and San Diego State in Anaheim, Calif. There are also home games against teams such as Fresno State and Long Beach State -- and the Bruins haven't exactly been unbeatable against mid-majors at home in recent years. "It's going to be a difficult schedule," Howland said. "We've got to win those games. That's been tough for us." Going to China in August will help prepare the Bruins for the long haul before a season that is crucial to both the team and its embattled coach. "This should be a great cultural thing for our players," Howland said, "and a great thing for us basketball-wise." Can Ben Howland survive at UCLA? Back-to-back teleconference calls Wednesday painted different narratives about the state of UCLA's men's basketball program. UCLA athletic director Dan Guerrero won't commit to Ben Howland being the head coach for the 2012-13 season, but he was quick to defend the overall direction of the program and its past success and character while also pointing out evaluation mistakes in the past three years. Meanwhile, Howland said he is confident that he will be the head coach going forward and can't wait to coach one of the top recruiting classes in the country next season, after finishing out this season with two home games and a wide-open Pac-12 tournament at the Staples Center in Los Angeles. So, what will be the repercussions of Sports Illustrated's investigative story? ESPN.com recruiting reporter Dave Telep spoke with the families of committed players Kyle Anderson and Jordan Adams and neither is waffling at this point. It's that 2012 class, which could also add No. 1 player Shabazz Muhammad out of Las Vegas' Bishop Gorman High, that gives Howland hope -- as does the return to a refurbished Pauley Pavilion after a nomadic season around the Los Angeles area. "I'm very confident in my abilities to lead this program in the future and feel very, very good about our current recruiting class and kids that we're involved with right now," Howland said. "They're coming down to the final weeks of their recruiting process before they make the final decision." He and Guerrero are tied together since the latter hired him nine years ago. The firing of Rick Neuheisel and the hiring of Jim Mora in the football program could also potentially stave off a Howland change. Few programs, especially in cash-strapped states, can afford the millions it takes to change both high-major coaches in the same season. Guerrero and Howland admitted that there were mistakes in evaluation and recruiting. There certainly were. The team aspect of the group that went to three straight Final Fours from 2006 to '08 simply hasn't existed over the past few years, as so vividly described in George Dohrmann's SI article. Once-heralded recruits are now scattered all about. Four of the top players in the West this season are all former UCLA players -- Drew Gordon (New Mexico), Mike Moser and Chace Stanback (UNLV), and Matt Carlino (BYU). The embarrassing losses in the 76 Classic in Anaheim two seasons ago and the overall substandard play rendered the Bruins irrelevant during the program's third losing season since the 1940s. Last season, the Bruins re-emerged to finish second in the Pac-10, beat Michigan State and then lost in the final few possessions to Florida in the NCAA tournament. But then the ugly losses occurred again to start this season against Middle Tennessee State and Loyola Marymount -- two quality teams but games the Bruins shouldn't lose at home. The Pac-12 is having yet another slumping season, but the Bruins have been mediocre in league play. And the suspension, reinstatement and then dismissal of Reeves Nelson earlier this season was clearly mismanaged. As highlighted by SI, the Nelson experience was essentially a disaster. On Wednesday, Guerrero and Howland said they knew of some of the allegations in the article but refuted others, saying that no assault-like behavior during practice occurred from Nelson, only hard fouls. Howland has always been a bit of a control freak, trying to micromanage his career and program at Northern Arizona, Pitt and most recently UCLA. Yet, for whatever reason, Howland lost control the past three seasons at various points, especially in the handling of enigmatic and volatile former forward Nelson. Dohrmann shined a detailed light on Nelson's explosive behavior with allegations of purposeful cheap shots and degradation of staff and managers. The SI story also alleges that there was drug and alcohol abuse by players. The story depicts an overall lack of respect for Howland, and a program gone wild. Guerrero expressed anger Wednesday on a news conference call, but was quick to defend the overall program to ensure that it wasn't painted with one brush. Guerrero went on to say that he had been with Howland for nine years and that there had been great character in the program. But he admitted that in the past few years, since the last Final Four in 2008, the program had broken away from that. Mistakes were made in evaluation. But he was quick to say that he liked the path the program was on, despite a few isolated incidents and bad decisions. "They haven't performed at the level we desire," Guerrero said. Howland had character in the program during the three Final Four runs. No one had negative things to say about Alfred Aboya and Luc Richard Mbah a Moute. Darren Collison consistently was revered as an ultimate team player. In his one season at UCLA, Kevin Love was beloved for his work ethic. But the recruiting misses, the departures of players not ready for the NBA, and the handling of Nelson all contributed to Howland being put on notice. A Final Four appearance doesn't guarantee job security. Paul Hewitt of Georgia Tech discovered that last year and Bruce Weber of Illinois may find that out as well after the season. Howland had three in a row. But he's at UCLA, which alongside Kentucky, Kansas, Indiana and North Carolina, is one of the most scrutinized programs in the country. Howland said UCLA is and has been his dream job. He has always been in awe of John Wooden and makes sure he says that he is simply watching over the late Wooden's program. But he won't for much longer if the program doesn't change the character within and ultimately win games that it should and compete for championships again. The cavalry is coming in the class of 2012. But the margin for error is now gone. The Bruins have to win at a high level next season and have to do it without incident and with the utmost class. If not, it's unlikely Howland will be around to see a class of 2013. UCLA coach Ben Howland said he is considering playing more zone so he can use a bigger lineup in the Maui Invitational. He said he will change some of the Bruins' man-to-man defense, too. He has no choice. UCLA is already in crisis mode, and the season isn't even officially two weeks old. But are they? Is it simply about the talent? It may not be, as Reeves Nelson, the Bruins' most talented player, has already been suspended and is clearly their most volatile player. 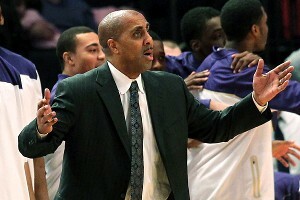 Nelson played in the Bruins' 11-point loss to Loyola Marymount. The game was a home game for UCLA, even though it is playing some games at the antiquated L.A. Sports Arena while Pauley Pavilion is getting a much-needed makeover. Nelson wasn't on hand for the disastrous 20-point loss to Middle Tennessee State, which is hardly a dominant power in the Sun Belt. LMU followed up its UCLA win with a seven-point loss to those same Middle Tennessee Raiders, who had quite a week in Southern California and are off to a 3-0 start with a home win over Austin Peay in their season opener. "We struggled coming out of the gate,'' UCLA athletic director Dan Guerrero said. "Ben is still trying to figure out how to use the personnel. Jerime [Anderson] didn't play in the first game. Reeves didn't play in the second game. He doesn't have the full complement of his players. We look to play inside out. We look to feed the post. Guys have to convert or dish and hit open shots. But that has manifested itself in the way Ben thought. We're getting the looks. But people aren't knocking down the shots. It's not that the perimeter players are taking bad shots. They are taking good shots but not making them. " Nelson was reinstated by Howland on Wednesday, despite getting suspended for conduct detrimental to the team. The Bruins are fortunate that they play Chaminade in the first round of the Maui Invitational and are in the more dysfunctional side of the bracket with Kansas and Georgetown rather than clearly established teams such as Duke, Memphis and Michigan (the Blue Devils play Tennessee, but this bracket is clearly lopsided by the way the teams are performing now). "The issue with Reeves he had to deal with it,'' Guerrero said. "He had to put his arms around it. It's a distraction. It's not a positive in any way, shape or form. He had a good opportunity to talk to his folks. We still have good talent on this team and it should be sufficient to win some games." But why should anyone expect the Bruins to regroup in Maui, or beat Pepperdine (which knocked off Arizona State), Texas, Penn (which gave Temple fits) or even Eastern Washington (which pushed Gonzaga) at home after Maui? The way in which they're lost to middling teams in the first two games has been frustrating. Howland said Middle Tennessee State is really talented. He said the Bruins aren't shooting well, and are missing wide-open shots. He also noted that the guard play has to be better, the defensive board work must improve and that they have had issues internally. That's a shot toward Nelson. But he may not be alone in his disappointment. The body language, according to someone close to the program, has been poor. There was the impression of indifference on this team. There was no one rallying the group and displaying passion about the current state of affairs. It doesn't help matters if the Bruins' best player was suspended. And that's why their season may rest on how the team responds to Nelson's reinstatement this week and in the first five minutes of the Chaminade game. The Bruins can't have leadership if the supposed leader isn't acting appropriately. It didn't help matters that Anderson, another veteran player, was suspended for the season opener, either. Point guard Lazeric Jones has struggled with eight turnovers and seven assists in two games. Tyler Lamb hasn't produced yet, either, shooting 27.8 percent from the field (5-of-18 from the floor and 2-of-11 on 3s). De'End Parker and Brendan Lane haven't been able to help much off the bench. And the front line of Josh Smith and the Wear twins, Travis and David, consists of largely role players at this juncture, or at least that's how they seem to be playing. If the Wear twins stayed at North Carolina, then they wouldn't have been able to crack the top six with the Tar Heels' addition of James Michael McAdoo. The talent level clearly isn't the same as it was during UCLA's three straight Final Four appearances with Kevin Love, Darren Collison, Luc Richard Mbah a Moute and Russell Westbrook, who developed faster and at a higher level than anyone could have imagined. The Bruins are nomadic this season without Pauley Pavilion. There is still time to figure things out. But the losses and the margin of defeat are befuddling. And it speaks to a larger issue than early-season suspensions and not being ready to perform. Of course, Jones is more talented than what he has shown. So, too, is Lamb. But are the rest just role players who have been thrust into starring roles? Howland wasn't panicking. Nor should he. The season is two games old. He has handled crisis management well. Two seasons ago, the Bruins lacked leadership and a point guard. Last season, they had more talent with Tyler Honeycutt and a mature Malcolm Lee. Both left for the NBA and are locked out like every other rookie and veteran. The long-term health of the program is on the rise with a stellar recruiting class for 2012 that includes Kyle Anderson out of St. Anthony High (N.J.) and Jordan Adams out of Oak Hill Academy (Va.). The opportunity to land small forward Shabazz Muhammad out of Bishop Gorman High in Las Vegas also makes this class potentially one of the best in the country. If that's the case, and that's fine, then the Bruins simply may not be talented enough to fix all of the problems. They may have to overachieve to reach the postseason. They made the NCAAs last season, but were grossly overhyped in the preseason -- even in this space. 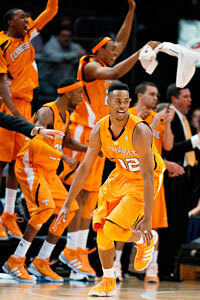 AP Photos/Henny Ray Abrams Undrafted Scotty Hopson certainly could've helped the rebuilding efforts at Tennessee. Kim Klement/US Presswire UCLA will still contend in the Pac-12, but Tyler Honeycutt and Malcolm Lee might've been the difference in taking the next step in March.